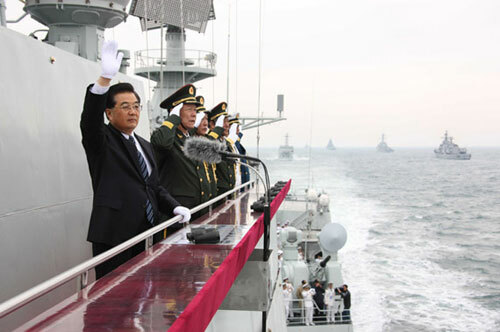 Chinese President Hu Jintao, aboard the Chinese Navy destroyer Shijiazhuang, reviewed Thursday afternoon warships and aircraft in a landmark naval parade off the coast of Qingdao. China concluded a four-day celebration for the 60th anniversary of the founding of the People's Liberation Army (PLA) Navy Thursday, with an unprecedented parade of PLA Navy warships and an international fleet review. The PLA Navy parade, the fourth staged in China since 1949, but the first on such a large and international scale, displayed 25 of the PLA Navy's vessels, including two nuclear-powered submarines, and 31 naval aircraft. The parade was followed by an international fleet review which saw the participation of 21 foreign vessels from 14 countries, including the United States's destroyer USS Fitzgerald and the Russian cruiser CG-011 Varyag. Amid the rhythms of "March of the Review," a Chinese melody usually played for formal occasions, the foreign vessels lined up in a row in the order of combatant ships, landing craft, auxiliary ships and a sailing ship for training. All the foreign ships flew their flags at full-staff. Chinese President Hu Jintao reviewed the Chinese-made warships and their foreign counterparts from onboard the PLA Navy destroyer Shijiazhuang in waters off the port city Qingdao. More than 200 military officers from foreign embassies in China, reporters and Chinese people from various social circles observed the fleet review on the viewing ship Zhenghe. The ship was named after a Chinese maritime explorer who sailed about 600 years ago. According to Rear Admiral Zhang Shiying, deputy commander of the PLA Navy's Beihai (North Sea) Fleet, all the Chinese vessels and aircraft paraded were independently designed and made by China, and represented the latest stage of PLA Navy equipment. All the submarines and aircraft, and the majority of the warships included in Thursday's parade came from the Qingdao-based Beihai Fleet. "The goal is to showcase the development of the PLA Navy over the past six decades," Zhang said. PLA Navy Commander Admiral Wu Shengli also said the celebration was aimed to demonstrate China's determination and capability to maintain a peaceful, harmonious ocean together with other nations. "The PLA Navy is willing to take the international fleet review as an opportunity to enhance cooperation and exchange with our foreign counterparts to better protect maritime safety," he said. Thursday afternoon's PLA Navy parade also featured the maiden show of two Chinese nuclear submarines, the Long March 6 and the Long March 3. It was the first-ever public appearance of the PLA Navy's nuclear submarines. "It has been the first time to see a Chinese nuclear submarine so close to me and many other advanced weaponry in the naval review," said Colonel Patrick Sice, Defense Attache with Embassy of the Republic of France to China, onboard the viewing ship Zhenghe. "To invite so many countries to the review shows that China would open more to foreign countries and in the future more willing to cooperate deeper in the Gulf of Aden and other regions." "China is emerging as a global power and there is nothing wrong with China's modernization of its navy and other armed forces. But more power means more responsibility and transparency. Otherwise you will lose confidence from the others," he said. On Thursday morning, China asserted once again that the country's military build-up was purely defense-oriented. In a meeting with heads of 29 foreign navy delegations gathered here to attend the PLA Navy celebration Thursday morning, Chinese President Hu Jintao pledged that China's armed forces, including the PLA Navy, would never be a threat to other nations. China would always be an important force in safeguarding world peace and development, he said. "For now and in the future, China would never seek hegemony, nor would it turn to military expansion or arms races with other nations," he said. The PLA Navy will be more open and practical in international maritime security cooperation in the future and unremittingly work towards the goal of building an harmonious ocean, Hu said. Hu's words were lauded by Lt. Commander Adnan of the Pakistan Navy, who said China's navy was emerging among the world top naval forces. The PLA Navy is an indispensable force to maintain world peace, he said.